Can you tame this wild animal? 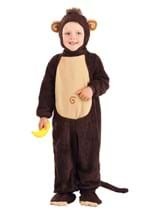 This deluxe gorilla costume for toddlers includes a black, furry jumpsuit that is made from polyester and snaps in the back for closure. The plush costume has a padded gorilla chest to add realistic detail. The sleeve and ankle cuffs are lined with elastic while the attached hand covers give the option to keep hands out or in for warmth. The hand covers feature slits to slide fingers through. The matching headpiece has a pointed top much like the head of gorilla and Velcros under the chin. A pair of foot covers are also included. A cute and cuddly Halloween costume that comes in an infant size too!